IP Statistics provides an information about IP datagrams. 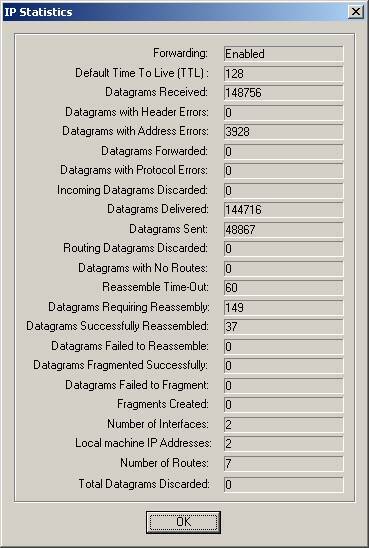 The IP statistics dialog shows the details about IP datagrams including forwarding enabled/disabled state , default time to live, the number of received datagrams, datagrams with address, header, protocol errors, forwarded datagrams, incoming datagrams that have been discarded, delivered datagrams , sent datagrams, routing datagrams that have been discarded, datagrams withought routing , interfaces , local host Ip address, etc. All fields are updated automatically for each received IP datagram.